Notice that among those that search for the Chevy 1500 Silverado, consumers are willing to pay for the higher end seating options. 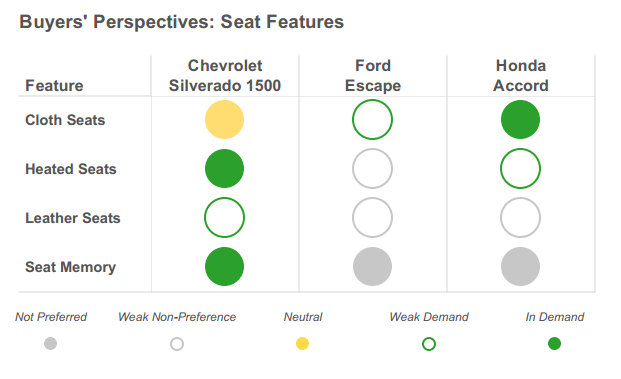 The green dots by heated seats and seat memory indicate that customers choose used Silverado 1500s at a higher rate when they have these features than when they don’t. 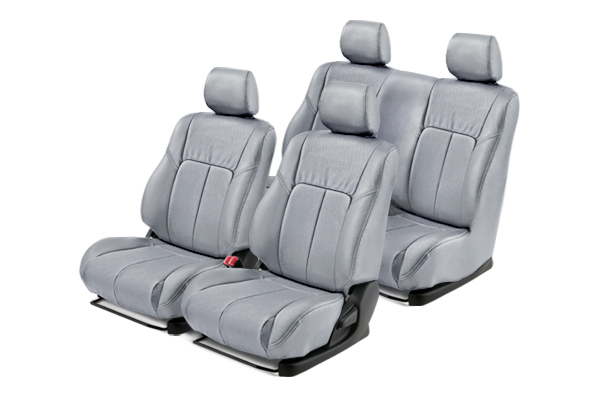 Cloth seats are found to have little to no impact on a buyer’s interest in the vehicle. When looking at the Ford Escape, we see a pattern nearly exactly opposite of that of the Silverado 1500. Customers tend to choose Ford Escapes with cloth seats at a higher rate than those with leather. Escapes with heated seats and seat memory are chosen at a lower rate than those without these features. This is not say that Ford Escape customers do not want leather seats or other high-end seat features, only that that they don’t want them enough to pay the premium. A very similar pattern can be seen with the Honda Accord. Showcase your vehicles with preferred configurations. Advertise your packed Silverado and your base trim Escapes and Accords. Does this example mean that you shouldn’t buy baseline Silverados, packed Escapes or luxury Accords? Not necessarily. It all depends on YOUR particular local market demand and supply. Are you currently looking at similar data to help determine how to merchandise and what to showcase in your advertising? great insight. love your data. it is also a good idea to highlight the top features (leather, MPG, low miles) in the beginning of custom comments – and use custom comments!